This is a revolution in orthodontics, at Severns Dentistry and Orthodontics we use Invisalign clear aligners to provide an effective way to straighten your teeth while remaining virtually invisible. Wearing the comfortable, customized aligners will gradually shift your teeth into their correct position. Correcting teeth alignment is imperative, not just cosmetically, but for overall health. Invisalign offers the best of both worlds: comfortable, efficient straightening with an essentially invisible appearance. At Severn’s we provide Invisalign in McMurray and the surrounding Pittsburgh area. Aligners are customized to fit your teeth, eliminating discomfort and irritation. Aligners are conveniently removable for brushing or cleaning. Helps in avoiding periodontal disease, which can stem from misaligned teeth. Can alleviate issues such as bite problems, mouth sores, and speaking/chewing difficulties. It’s tough work being a teenager today, with the increasing pressures of school, activities, and social events and adults have the pressure of work, bills, and more. 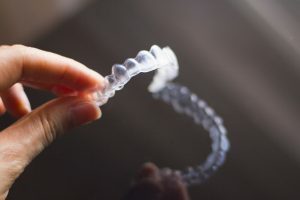 That’s why many adults and teenagers are turning to Invisalign—the trendy teeth straightening treatment that’s quickly becoming the preferred choice of many. When you are self-conscious about their appearance, and traditional metal braces don’t exactly blend in. This is why Invisalign is such a breath of fresh air. Your or your teenager’s teeth can be straightened while they feel good about how they look under treatment. The clear, nearly invisible appearance of Invisalign or Invisalign Teen disguises braces beautifully. Adults can go to work without having to worry about braces and teens want to fit in, blend in, and look the part. Now they will. Also, the plastic aligners are smooth and comfortable, making them easy to wear. You won’t have to put up with periodic irritation or possible wires breakage. Who wouldn’t like fewer trips to the orthodontist office? Hectic weekdays and weeknights make the convenience of Invisalign or Invisalign Teen a huge factor. You will receive your custom aligner trays ahead of time, with instructions on how to wear them—for how long and when to switch. It’s easy and straightforward and perfect for a busy family. Flossing your teeth is a breeze with Invisalign! Your teen can simply remove the aligners while eating, brushing, and flossing. This lessens the chance of food getting caught in the wires and brackets and increases the likelihood that your teen will floss and keep their gums healthy. Call your Severn’s Dentistry today to find out if Invisalign in McMurray is the right choice for you. At Severns, we offer a complimentary consultation to give you and your teen a chance to ask all of your questions and get the answers you need to make an informed decision.